Ever have a moment where you felt like your over-protective gene might have been a little worth it? Mine seems to be working overtime since we had children, but every once in a while, I feel like it pays off. 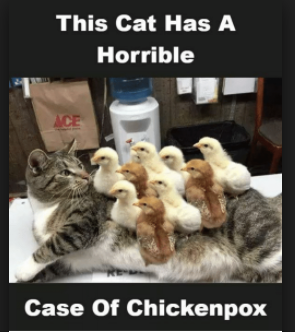 As we walked into daycare, there was a notice to parents that there had been a case of chickenpox in the center. The board might as well say, “Guess what’s coming home with your child to infect the whole family!” But this time, I ignored it. Didn’t apply to us because both my children are vaccinated for it. My oldest daughter sees the sign and sounds out chickenpox. She’s precocious that way, and it means you can no longer spell stuff to get it passed her. Anyway, she then turns to me and asks me what chickenpox is. I explain that it’s a really nasty sickness that some children get, but she won’t have to worry about it because she’s vaccinated. Those shots she doesn’t like getting are protecting her. She asks me if that’s why I make her get the shots. I say it is, and isn’t she glad she doesn’t have to worry now. She nods and scampers off to class. If only this was as bad as it got. I didn’t think much of the exchange until I was driving into work and remembered how bad I’d had chickenpox. So bad they were on my eyelids, in my throat, and covered my back, chest, arms and face. Even my legs were peppered with them. It was over a week of hell. I itched so bad I hurt. I’d wake up scratching and my sheets would be streaked with blood. My mom got cotton gloves for me to wear while I was asleep. We tried calamine lotion, backing soda baths, oatmeal baths. They helped a little, but the entire ordeal was torture. About the only time I got a drop of relief was when I stood outside in the dead of January winter. It was so cold and snowy that my skin sorta numbed. My mom wouldn’t let me do that long or often as I was already sick and she didn’t want to make it worse. First time in my life I appreciated living in a cold place. Once the disease has run its course, the chickenpox scab over and you’re no longer contagious. But, you look like something out of the Walking Dead. Of course, going back to school was such a “joy”. I wore a turtleneck to hide as many of the scabbed-over sores as I could, but I couldn’t hide the ones on my face or hands under a sweater. The kids teased me mercilessly. So, when the doctor asked me if I wanted to vaccinate my kids for chickenpox, I said yes. Even if insurance didn’t pay. I didn’t ever want them to go through that. First chickenpox scare, and neither girl got it. How about you? Your over-protective streak ever save you from something? Maybe your kids? Or are you on the other side, where you’re glad you took a risk and it paid off? Ahem. 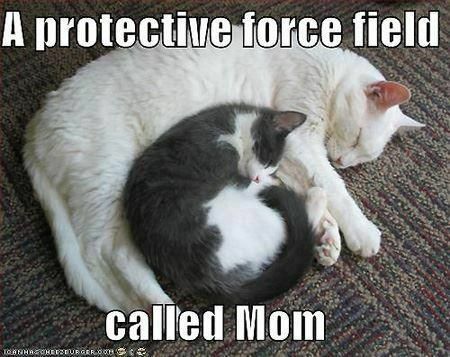 I’m sometimes accused of being over-protective of my cats. I deny it.